but every once in a while, it’s just nice to eat something that UNHEALTHY, PROCESSED and full of calories and carbohydrates. And that’s where Mos Burger comes in handy. Now they have a whole selection of choices and it’s up to you which one you pick. But after some serious testing, we’ve come to the conclusion that the Premium Beef Burger is the only burger any reasonably minded person would choose to eat at Mos Burger in Bangkok. The Cheese Burger, the Rice Burger, the Teriyaki Burger – forget about them. Just go for the Premium Beef Burger – it’s like a hundred times more delicious than the other ones. You go to the cashier, make your order, pay, and then you get a little number that you carry to your table. Then you sit and wait. And that’s the worst part about Mos Burger. Sometimes you wait 15 minutes for your order to come. So it’s not exactly fast food, and if you insist on calling it that way, then it’s probably the slowest fast food on earth. But there’s a good reason why they make you wait: they wanna get it just right. And they do. When it comes to preparing burgers, there’s always a balance to find between speed and quality. Yes, you can get your burger in no time at McDonalds – but you won’t get quality. 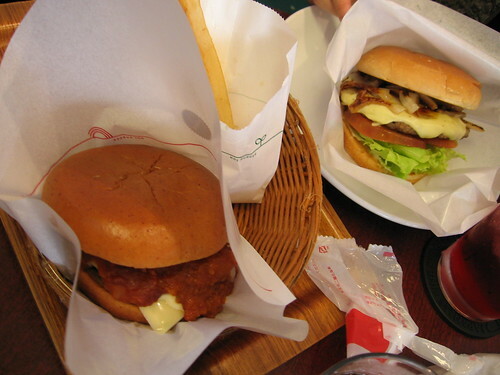 But with Mos Burger, it’s the opposite. You wait, and wait – but finally what you’re getting served is well worth the wait. A Premium Beef Burger costs around 90 baht ($3), and it’s superyummy. Not cheap for Bangkok standard, but if you consider the quality of ingredients used, it’s great value for your money. You can find Mos Burger at several places in Bangkok: in the food floor of the Siam Paragon, in Central World Plaza, in the Emporium, in Central Departmentstore Chidlom and in Future Park Rangsit. The one at Siam Paragon is probably the easiest to get to, as most people who go on a Bangkok sightseeing tour visit the Siam Paragon shopping mall too.